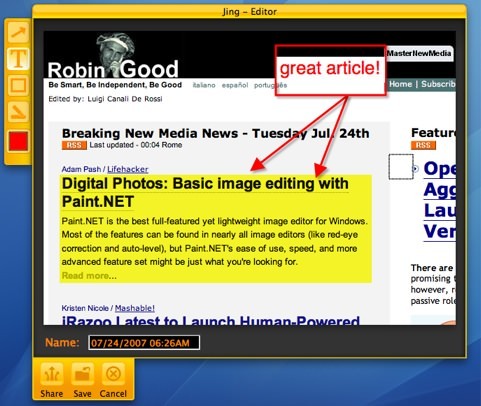 Screen Capture Tip: Use Jing! I’ve been using this little screen capture tool for several weeks now with very positive results! 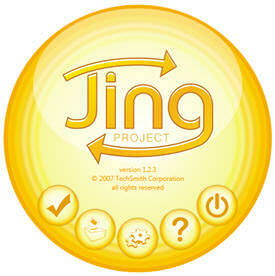 Jing is available to Mac and Windows in both a Free form as well as a Pro (pay for) form. Using Jing, you are able to quickly capture a screenshot of a specific window or a pesky little software bug in action, upload it to an online source and paste the link all within a matter of seconds! If you can’t capture what you’re looking for in a simple image, you might like the option to capture a video of what you are doing on your desktop and share a link to that instead! To use Jing, you simply select it from the top of your screen (where it waits by default) and click capture. You’re then given a selection tool that allows you to pick to screen space that you want to capture….nothing more, nothing less. After selection the area that you want to capture, you simply specify if it’s for an image or for a video. If you click image, you will have your capture almost immediately and can pick where to store it! If you select video, you will have 3 seconds to prepare your cursor or anything else you need to do. After the count down, video recording begins. Simply click the stop button when you’re finished and pick a source to upload to! One feature that I’ve only just started using is the FTP option to upload my captures to kyleabaker.com! Thus far, I’ve used Jing to capture tons of bugs that would have otherwise been nearly impossible to capture. Aside from the slightly noticeable resource usage and slight hang when it’s first activated, Jing is an excellent tool that I would suggest to anyone who needs to capture a visual from your computer screen! Next Next post: Free Google Wave Invites!